Trane heat pumps are among the most reliable brands on the market today, while the Trane XV series is the most advanced and efficient from this manufacturer. Check out its top features and how they can benefit you. 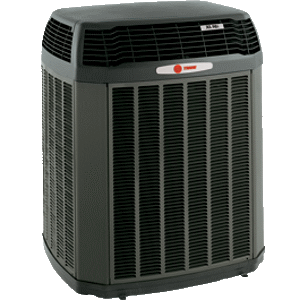 Trane is the company that developed variable speed compressors so the heat pump provides heating and cooling effectively at the same time as it keeps the compressor running at the level it has to, not at the highest setting at all times. For additional benefits, you can match your Trane XV heat pump with other Trane products for the most effective HVAC performance. Trane has been around for 100 years manufacturing HVAC units and innovative solutions for an ideal climate comfort. One of these advanced features is the TruComfort compressor that runs only at the speed necessary for maintaining the set temperature. This is possible due to the variable speed inverter compressor that can use 750 stages for the precise output where the capacity is ranging from 25-100%. It adjusts its output regularly based on the changes of the temperature inside and outside while keeping the fan speed as low as needed. That keeps energy usage and fan noise down – by running at a low speed regularly instead of turning off and then powering back up at full power. Did you forget to reset your thermostat before you left the house? With the Trane Nexia Home Intelligence system, you can access your system anywhere you can access your tablet, phone, or computer. Besides controlling your HVAC system, you can use Nexia for your whole house to control lights and video cameras. Trane backs their products with some of the best warranties in the business, like a 12 year compressor warranty and 10 year warranty on the internal parts and coil. As only as few other brands, you can purchase a transfer to the next homeowner. Think about how much peace of mind that will give you, since typically it is the compressor that is the most affected and expensive components. Because the Trane XV series uses a variable speed compressor and fan motor, including the sound insulator, it is one of the quietest heat pumps available, coming it a mere 54 decibels. It will also keep your house at an almost perfectly consistent temperature inside, within a half a degree either way of your thermostat’s setting. The ComfortLink II control board inside the heat pump ensures that all of the various components communicate with each other and help you stay comfortable. This feature is available only on XV models. The fins and coil are made of lightweight but strong aluminum, a metal well known for its ability to transfer heat efficiently and not corrode in wet conditions. Further ensuring the weather durability of the Trane heat pump is the WeatherGuard II polycarbonate exterior and DuraTuff rust-resistant base pan that is designed strong and resistant to corrosion and impacts. The powder paint on the outside provides additional protection. Louvered panels made of galvanized steel on the sides of the heat pump help protect the innards from the weather and still allow an unobstructed air flow for efficient operation. For added comfort and great inside climate, the TruComfort controls also controls humidity inside the house by circulating air all the time, preventing the house from getting too stuffy. Plus, lower humidity levels mean you can set your thermostat to a higher setting and still stay comfortable. The Trane XV series also pairs nicely with the CleanEffects home air filtration to remove over 99% of pollutants from the air, things like pollen and dust, which is great for allergy sufferers. Trane also uses R-410A coolant so you can relax knowing that your heat pump does not contribute in polluting the atmosphere with the toxic chlorine. The XV20i heat pump delivers a top of the line 21 SEER cooling in the summer and an effective 10 HSPF heating rating. That efficiency means this heat pump is Energy Star rated and could qualify for national energy incentive rebates. The 54 decibels of operating noise is as much as 4 decibels lower than any other brand can offer. This is a tall unit, standing 48-54” high, making it one of the tallest heat pumps in the market as well. For most people this will not be a problem, but in the housings with the limited space, this might be a consideration. At a slightly lower SEER rating of 18, XV18 is still a very efficient cooling device keeping you comfortable in the summer and with the 10 HSPF relaxed in the winter. The model also offers you 54 decibels of operating noise for the quietest operation you can find. When comparing all the Trane heat pumps side by side, it can be noticed that the XV series is the most powerful and advanced group. Except the innovative design and quality features already found on all other models, features such as the variable speed inverter compressor and its 750 stages, compressor sound insulator, woven SpineFin coil, variable speed fan motor, low noise level, long warranty and high efficiency, are what makes this group of Trane heat pumps great, efficient, reliable and long lasting.